Today I would like to present the website Cape Breton Sessions in Ottawa. Each week musicians meet for a session with folk tunes from Cape Breton. The music which is regularly played is available as a book of sheet music with today 52 sets of three to six tunes each. The sheet music can be found on page “Tunes”, search for “Full Book” to get the complete book as one document. You can also find a collection of popular Christmas tunes. 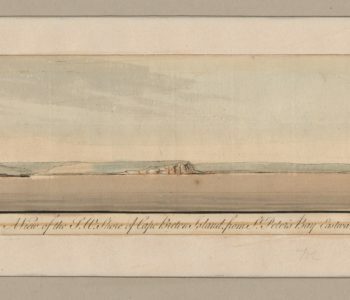 On the website of the Cape Breton Session you can also find a link to the website by Alan Snyder who has compiled a huge database of recordings of Cape Breton tunes. 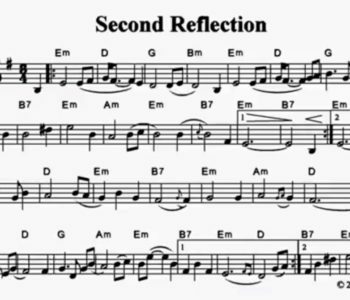 You can find also the beginning of each tune in sheet music and a midi version of the tune. Finally a playlist with Cape Breton tunes that I have compiled. Some time ago I have found the youtube channel of Anne Delong. Anne Delong is a mandolin player from Ontario, Canada. She is also composing fiddle tunes and other melodies. She is presenting her tunes as recordings with sheet music in her youtube channel. You can easily play along with the video or make a screenshot to get a printed version of the music. Anne Delong has pubished two books with her compositions, you can find details about the books on her website. Anne Delong is a retired teacher-librarian and computer resource teacher which helped definitifely to present her compositions as youtube videos and on her website. She is also maintaining several websites like the website of the Mandolin Society of Peterborough. Mike Cole and Anne Delong played at a small festival in Whitevale, Ontario in September, 2018 along with a number of other musical groups and solo artists. This video shows Anne Delong with Mike Cole. The latest tune that can be found in the youtube channel is Carly, Bring the Barley. Hendrik Luurtsema is a mandolin player from the Netherlands. I have recently discovered his mandolin videos when I was looking for other recordings of Midnight on the Water which I had just recorded for my youtube channel. 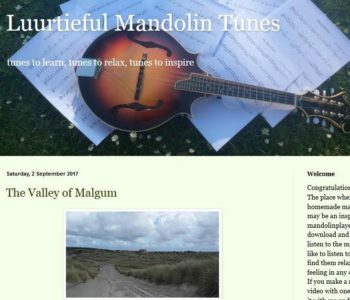 When I was looking for more information about Hendrik I found his new blog where he is sharing recordings and sheet music of mandolin tunes composed by him. Hendrik presents his pieces with some background information about what has inspired him to compose the tune and about his recording. Hendrik is also an active member of the Mandolin Cafe, he has recorded many videos for the Song of the Week social club. I have compiled my favorite mandolin tunes plyed by Hendrik in this playlist – you can find many more videos in Hendriks youtube channel. Het leven is vol met uitersten. Soms is het vrolijk, soms is het mineur. Soms een grap en grol, soms heel serieus. luurtsema & klein bezingen met hun liederen alles waar het leven vol van is. Giacomo Sartori is one of the important Italian composers of mandolin orchestra music. The works by Sartori have become public domain in 2017 – 70 years after his death in 1946. Some works by Sartori have belonged to the repertoir of almost every mandolin orchestra, especially the waltz Tramonto and the Potpourri Popolare are great works in the typical Italian style of mandolin music of the early 20th century. 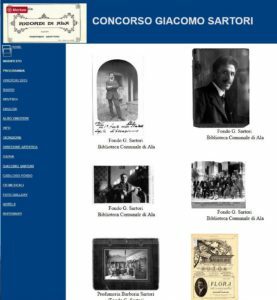 A biography of Giacomo Sartori can be found on the website of the mandolin orchestra Euterpe. Actuación de la Orquesta de Plectro “Torre del Alfiler” en el XII Festival Internacional de Plectro Ciudad de Valladolid. Omaggio a Trento, de Mario Giacomo Sartori. The mandolin orchestra Aurora from Vacallo in Switzerland was founded in 1926 by master Vittorio Pozzi. The video was recorded in 1981. Video del concerto eseguito nella chiesa di Santa Croce a Vacallo 1981: diretto dal maestro VITTORIO POZZI . 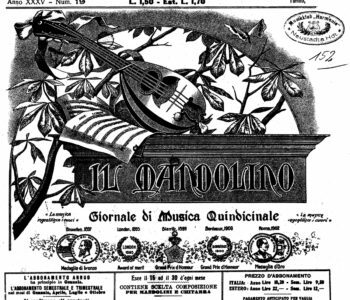 Il circolo mandolinistico è un complesso del basso TICINO ha origini lontanissime, costituito nel 1926, quando alcuni giovani appassionati di mandolino e chitarra furono riuniti ed istruiti dal maestro VITTORIO POZZI denominata ORCHESTRA AURORA. Il Video è un raro documento che ben poche orchestre lo possono vantare per la data 1981 registrato su apparecchiature browcast. I will add more scans of works by Giacomo Sartori during the next months. If you can contribute scores to be scanned please contact me! with additional information about Giacomo Sartori, the competition and pictures. The 6th International Competition Giacomo Sartori for mandolin orchestras, mandolin quartets and mandolin & guitar duets will take place April 21 – 23 2017 in Ala in Italy.